There’s just something about being a twin that makes people always, always ALWAYS want to throw the two of you together at every available opportunity. To this day, I don’t get the fascination people have with it, but the phenomenon is real- especially when the twins are young. They’ll be expected to dress alike. In pictures, they have to stand next to each other in pukey-cute poses that immediately make it ‘clear’ that they’re twins. Their two names are almost always called together as one long name- as if they’re one single entity. Jas and I certainly experienced all of this when we were young. I kinda think a large part of it was because we grew up in the 90’s, i.e, the era where Mary Kate and Ashley Olsen and Tia and Tamera Mowery were at the height of pop culture. Thanks to them there was already a kind of fascination/curiosity for the ‘twin thing’ anyway, so we’ve literally heard, seen and done it all when it comes to Twin Etiquette. No, I can’t read her mind. No, I can’t feel it when she’s sick or in pain. Yes, we’ve switched places, but it was only once in the 1st grade and it was so boring that we never did it again. No, we don’t like dressing alike. Yes, she’s one of my best and only friends. Yes, sometimes we do finish each other’s sentences- but that’s only because we’re besties and have spent just about every day of our lives in each other’s company. Not that it bothers me too much- you get used to it. In fact, there are even fond memories we have of getting slapped with the Twin Thing trope. Case in point, a Christmas play we both were in some years ago. It was in the 7th grade (so we were around 11 or 12 age-wise) and out school was putting on a production of The Christmas Carol. Both Jas and I like acting, so we both decided to audition for a part. To be honest, I wasn’t feeling very optimistic. Not because I didn’t think I was any good-I actually think I’m a pretty decent actress. Really it was because in my experience, most people are so hooked on that Twin Thing that sometimes they feel as though Jas and I are a ‘package deal’ so to speak-basically if you get one, you get the other. Some people are cool with that, but some aren’t. I was concerned about 3 different scenarios here: first that neither one of us would get cast; second, that one of us would get cast and the other wouldn’t; or third, one of us would get a good art while the other just had a non-speaking crap part. It’s not that Jas and I were petty or jealous of each other like that. We’re just so used to the Twin Thing that when one of us gets a good thing that the other doesn’t get, we tend to feel guilty or sorry for each other. I just wouldn’t have enjoyed being in the play as much if Jas couldn’t be there with me. See? Sometimes being a twin really isn’t all it’s cracked up to be. Anyway, when the cast list was actually posted, I was pleasantly surprised. Both Jas and I had gotten pretty good speaking parts. Actually, we’d gotten the same good speaking part. Much to our surprise, the director had decided that in our school’s rendition of The Christmas Carol, there would be 2 Ghosts of Christmas Present. We would literally be dressed in identical costumes- even our hair was styled the same. Some of our lines would be spoken in unison, while some we got to speak on our own. So basically, we swapped out the ‘I’ pronoun for ‘we’. I think it was an improvement on Dickens’ original idea (but then again I’m probably biased about that). Did it feel cheesy at times? Yeah, but that time I didn’t care about having to do the Twin Thing. It was a lot of fun. And thanks to that experience, there’s an entire section of the Christmas Carol that I can still literally quote from memory. How many people can actually say that? Do you realize that there’s only 3 days left until Christmas? That means we’re also nearing the home stretch of our 12 Days of Christmas Series. 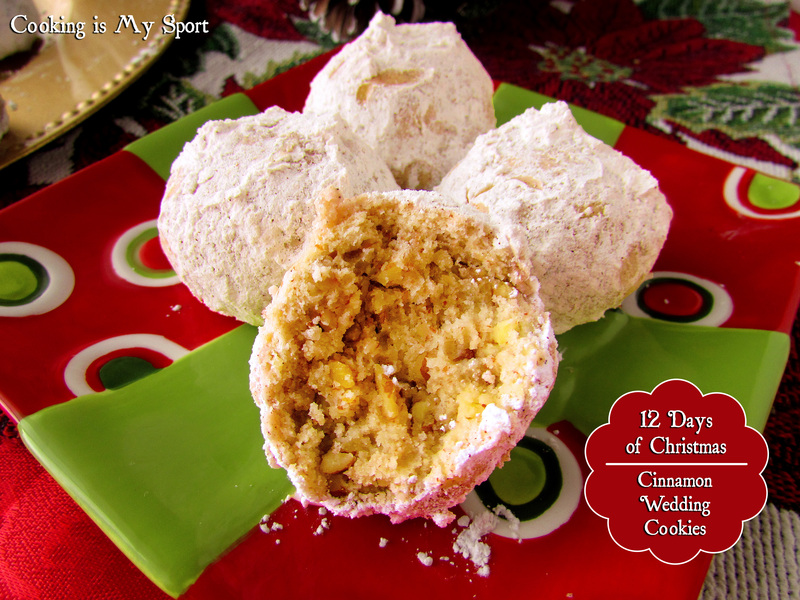 Today’s recipe is another classic: the wedding cookie.Or as we know them in my house, Snowball Bon Bons. Like Linzer Cookies, these are also one of the earliest memories I have of Christmas as a little girl. 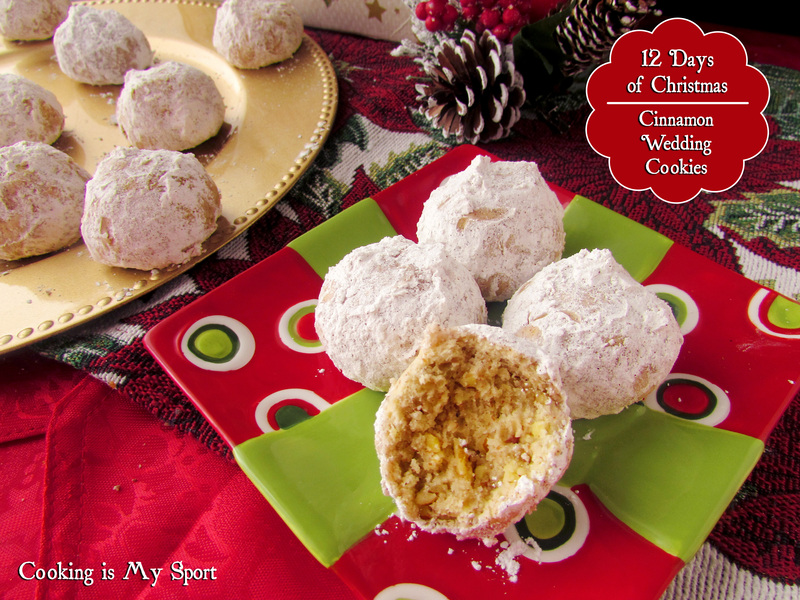 Buttery, cookie batter mixed with nuts is rolled into balls, baked and then coated in powdered sugar. They’re not only ridiculously easy to put together- they’re also super easy to ‘decorate’. 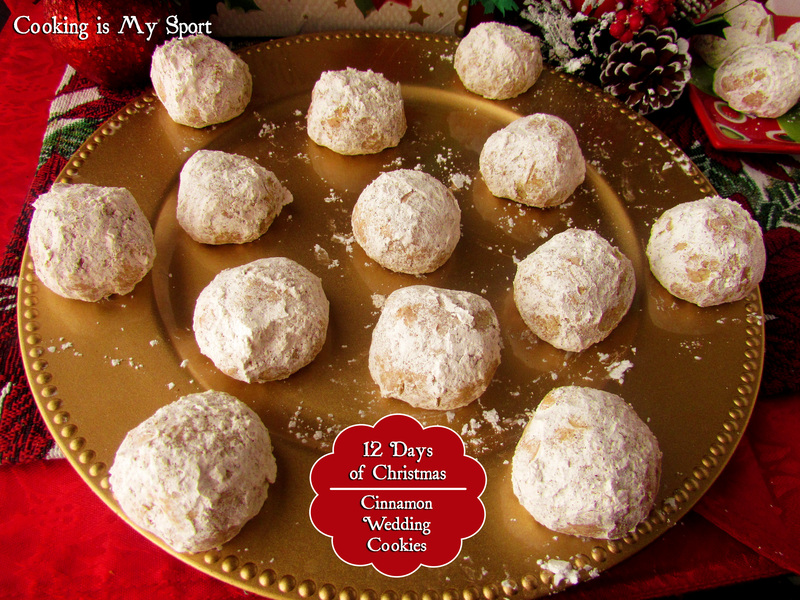 This recipe is a slight twist on the classic version with the addition of cinnamon to the sugar coating. I’ve found that people who don’t even like cookies (poor, unfortunate souls that they are) LOVE these. You really can’t eat just one. Seriously. I dare you. 1. Place toasted almonds in bowl of food processor and pulse until coarsely ground, about 10 pulses. Set aside. 2. In the bowl of a stand mixer fitted with a paddle attachment, beat together butter and 1/4 cup confectioners sugar until blended. Beat in vanilla. Add flour and salt and beat until just combined, then beat in ground almonds. Cover dough in plastic wrap and chill in refrigerator for at least 1 hour, or overnight. 3. Adjust oven rack to upper and lower middle positions and preheat oven to 350°F. Line two baking sheets with parchment paper. In a medium bowl, whisk together remaining 1 cup confectioners sugar and cinnamon. 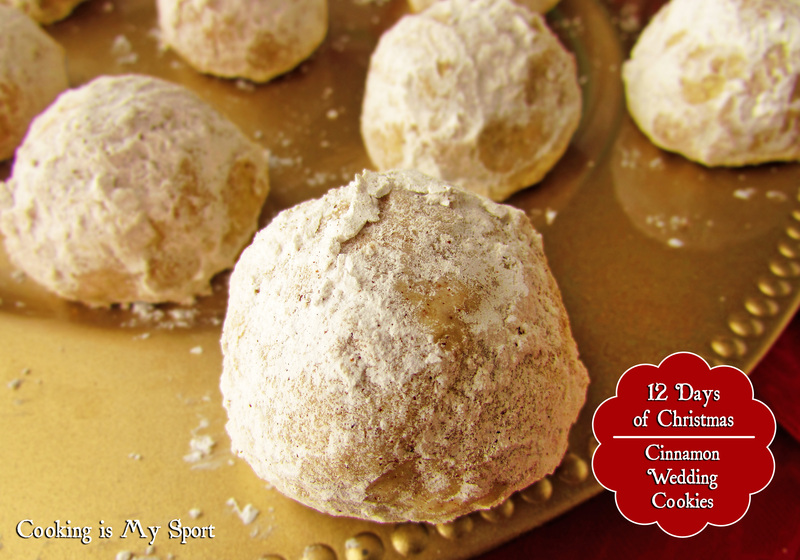 Take dough from fridge and roll into walnut-sized balls, then place on baking sheet. 4. Bake cookies until golden on top, 15-18 minutes. 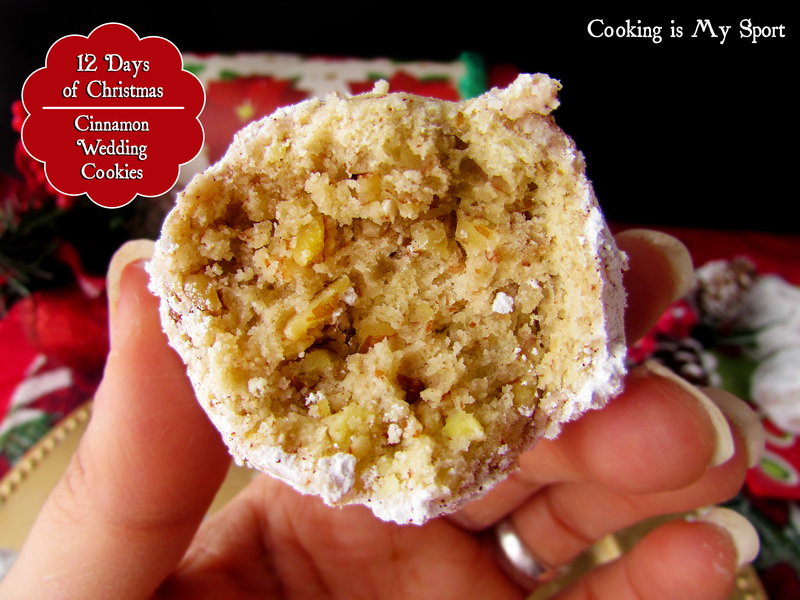 When cool enough to touch, roll balls in confectioners sugar mix, then place on cooling racks. When cooled completely, roll again in sugar to coat. Another great cookie, Jess. This was one of the cookies my mom made when I was young. 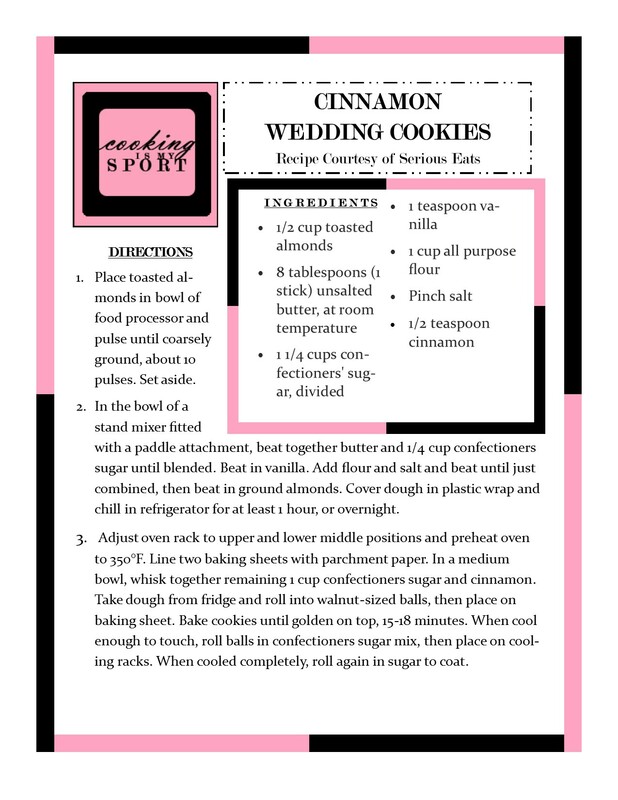 I think your version is an improvement on the classic…love that touch of cinnamon! Another sweet Christmas memory, too. 🙂 I’ll be anxiously awaiting the “grand finale” of your 12 days series! These are adorable – and so simple! I love your twin story. Goes very well with the cookies. Mmmmm cinnamon! Happy home stretch to Christmas! I love these they are my favorite. this cookie seems really special. I have gifted a couple with some wedding cookies, but these look even better.